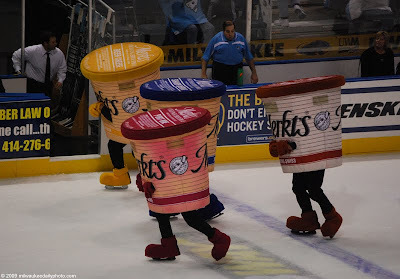 The Brewers have the Racing Sausages, and the Admirals have the Merkt's Cheese Spread race. The cheeses (Port Wine, Beer Cheese, Sharp Cheddar, and Almond Swiss) lace on their skates and race two laps around the rink. Contact is apparently encouraged, and it can be an all-out battle at times. How did the port wine do? Always been a faovrite of mine!